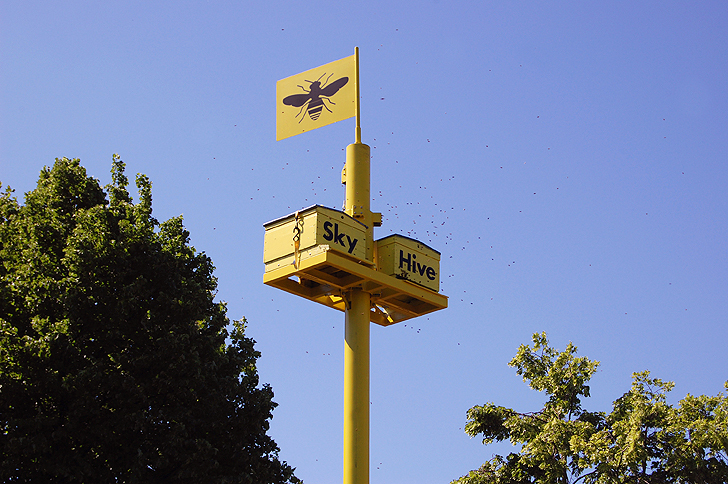 Bee Collective’s Sky Hive is a towering yellow urban beehive located in downtown Maastricht. The prototype was created to help support urban beekeeping, while keeping the bees safely out of reach from passersby. The adjustable beehive stands atop a tall pole, creating a presence at a public park, while being far enough away to mitigate fears of bee stings. Sky Hive’s first prototype has been placed in the heavily foot-trafficked Sphinxpark, where locals and their families congregate daily. 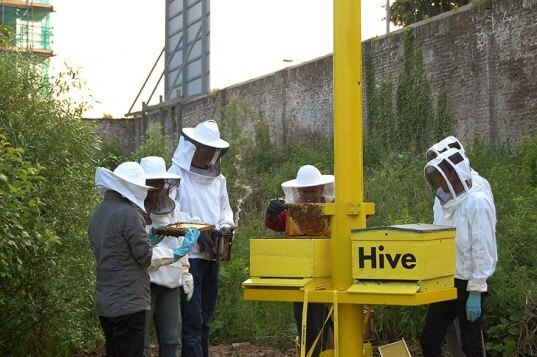 In bright yellow with the words “HIVE” painted on the side, the rectangular urban hive brings awareness to the citizens of Maastricht, striking up a conversation on the importance of bees. Trained beekeepers maintain the bees each week, lowering the hive to ensure healthy honeycomb and colony growth. Each of the Bee Collective’s experts take a turn tending to the bees, while also talking to the public about the methods for upkeep. The experts also give educational talks about the importance of bees’ pollination, and their necessity in producing the area’s favorite fruits, vegetables and flowers. While the Sky Hive was designed to foster bees in an urban environment, it can also be installed in the countryside as well. The hive sits almost 20 feet above ground, and can be lowered to any desired height. By placing the hive in the sky, people concerned with swarms or stings are protected, but the bees are also protected from vandals. The Sky Hive is an innovative urban prototype that incites curiosity from afar with a bold and bright design. Sky Hive’s first prototype has been placed in the heavily foot-trafficked Sphinxpark, where locals and their families congregate daily. In bright yellow with the words “HIVE” painted on the side, the rectangular urban hive brings awareness to the citizens of Maastricht, striking up a conversation on the importance of bees. Trained beekeepers maintain the bees each week, lowering the hive to ensure healthy honeycomb and colony growth. Each of the Bee Collective’s experts take a turn tending to the bees, while also talking to the public about the methods for upkeep. The experts also give educational talks about the importance of bees’ pollination, and their necessity in producing the area’s favorite fruits, vegetables and flowers.